The writing is tight, the cinematography is gorgeous, the editing is excellent, acting? Don’t even ask! It’s A+++. 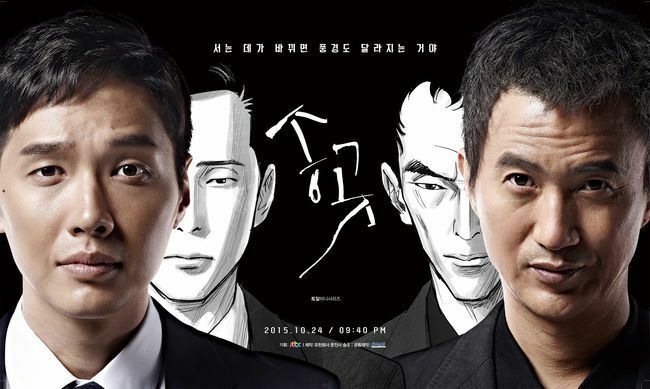 Awl (송곳), a drama from JTBC that aired in 2015 is a thought-provoking drama that’s very well-written and well-made. I literally loved everything about the show and it made it all the way to my all-time fav dramas list. It is very safe to say that Awl is a drama everyone needs to watch at least once in their life. The story is heavy, definitely not everyone’s cup of tea. But you need to watch this. Awl is definitely going to change your definition of an amazing drama. I loved everyone! Not a single bad actor in this. Whoever the casting director was, you did an excellent job in this one, Sir! Even Yesung did great. I was really skeptical about his casting but he did great with his role. Ahjummas and all members of Fourmis Labor Union were very natural in acting. The emotion, hatred, frustration, and joy were acted out in such convincing way and I felt them! Ahn Nae Sang is now a wise man in my drama dictionary! He used to be a permanent abusive father thanks to Kill Me, Heal Me but in Awl I saw him in different light. He shone in this one. He really did. Ji Hyun Woo looked so pitiful yet so charming. I really liked how he played out his character flawlessly. I loved the way he conveyed such raw emotions. A special shoutout to Kim Hee Won! He did extremely great in playing two different sides of Store Manager Jung, the bad and the pitiful. In first few episodes he was such an abusive manager who abused his power to fire the workers. But as the story unveiled, he became a pitiful person who dedicated his life to Fourmis but he didn’t get what he deserved, a recognition for his hard work. I couldn’t bring myself to hate him because he was in tight position and he had no other option than being an abusive manager. P A R A D I S E. The cinematography was something to die for. The camerawork was so gorgeous. Ever scene had emotion and was so slick, polished, and crisp. The editing was different compared to other dramas. Usually before the flashback scenes, your screen turns black or white for milisecs right? or, if not, the flashback scene will appear slowly or the present scene gets blurred then the flashback pops up slowly. Or, that iconic flashback sound is inserted. Or, the flashback scene (image tone?? Color? I don’t know what it’s called) is different than the present scene. It’s all made to differentiate the present and the flashback. But in this one, the flashbacks were treated just like the present scenes. But it didn’t confuse me at all. That’s so great! The story was so great! It might not move super fast but definitely not slow either. It was very thought-provoking and couldn’t help but hated Gaston and that fat Director Jung. The writing was deep. It didn’t only tell how they united under the Union umbrella and their fight for fair treatment but the story also told us about their human side. How they faced the problem that arose within the Union, the difficulties Fourmis had them gone through, their bond as they got closer to each other, everything was written in such a beautiful way. Their personal problems and the unfair treatment from the company were incorporated together and it made the story became even more heartwarming. I liked it that the writer didn’t beautify the Union. Instead the writer gave us like only the bad things about Union. The tension felt so real. The frustration and hopelessness delivered through the screen. Soo In(played by Ji Hyun Woo)’s narration was perfect fit for the show it actually added extra point. It balanced out every character’s own story even though it focused a little bit more on Soo In’s life. I loved how every character’s personal life was retold especially Soo In’s. The editing played big role here. Soo In’s past in the army was effortlessly beautiful. Like, he didn’t get his position without struggling first you know. The series of his army life was the highlight in every episode for me. LOL. Largely because I’m always weak when it comes to hot guy dressed in army attire. Mr. Ko Shin’s speeches were gold. There were so many times I nodded my head as listening to his speeches. His lines –most of time, not only his speeches- choked me up many times. Couldn’t help but kept on nodding expressing my agreement with everything he says. The story got more intense as the story unfolded. Their struggle felt so real, that’s a piece of gold writing skill there! The execution complemented the writing, making the show became really enjoyable. I can’t stress enough how much this show exceeded my expectation and how much I loved the show. It’s just beyond everything that I had in mind when I started the show. Your emotion will get involved for sure! LOVED, LOVED EVERYTHING. The BGM was cleverly inserted and it helped building up the right emotion. Like, Fallen Heart was used when the characters were in deep thought and in hopelessness. Inferno Symphony was used to build up the proper suspense. Every instrumental makes it hard for you to forget the drama. Because when you listen to it even only 30 secs, you’ll get reminded again of a scene the BGM was used. As a whole, Awl is a very recommended drama. It has flaws but it still exceeded my expectation and full of surprises. The writing is tight and is a gold. A show that gets you emotion and feeling involved! Will I Watch it Again? Yes!!!!!!! !